Martin Moran, Murdo Jamieson and Francis Blunt pulled off a magnificent route on Sunday (December 19) with the first winter ascent of Feast of the East on the Eastern Ramparts of Beinn Eighe. In a remarkably efficient ascent, Murdo climbed the steep first pitch to the girdle traverse ledge, Martin made a superb lead of the second tech 9 crux pitch, and Francis powered up the final steep bulging 5b crack. 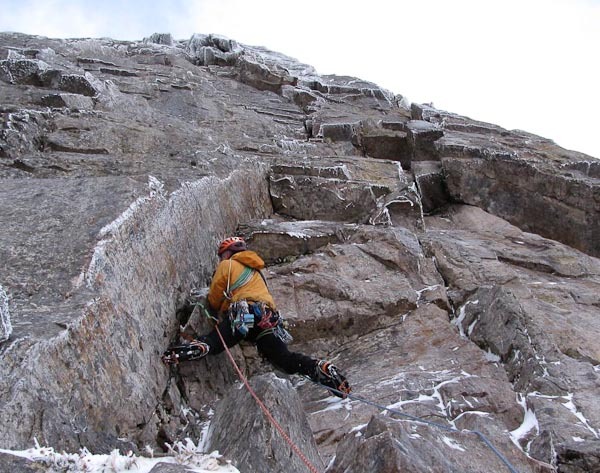 Martin has had a superb start to the season with the first ascent of Omerta in Coire an t-Sneachda and repeats of The Secret and The God Delusion, but this time it was the pressure of leading under the full scrutiny of his more youthful companions that provided the greatest challenge. This entry was posted in New Routes and tagged Beinn Eighe, Francis Blunt, Martin Moran, Murdo Jamieson. Bookmark the permalink.